Who Made the Cut This Year? Thousands of products are introduced to the toy industry every year, but only a limited number are good enough, playable enough and innovative enough to garner an award. Physics by SCIENCE WIZ / NORMAN & GLOBUS INC. Blast off with Newton's laws of motion and prepare to excel in PHYSICS! Develop a fundamental understanding of inertia, the laws of motion, centripetal force, mass, weight, velocity and acceleration. Concepts are covered with time tested experiments and highly visual illustrations. This kit includes a balance scale for measuring mass, a stopwatch accurate to 1/100 of a second to clock speed and a jet car that really zooms. Chemistry by SCIENCE WIZ / NORMAN & GLOBUS INC.
40 page science book with materials. Candle making, water squirting, freezing thawing, glop, and mud pie experiments -- things every child should do to explore the matter of matter. 35 activities include: Capture a CO2 explosion; Squeeze an egg into a bottle; Grow crystals and more. Authors Note: When my children were small they tested the experiments that are in this book. We sorted through many, many projects and picked our favorites. In high school and college both my son and daughter loved chemistry. I took a lot of chemistry, but I never loved the field the way my children do. I think this kit and their early experiences with chemistry had a lot to do with this difference. Four-wheel drive takes on new meaning with this foot-powered rider. Encourage lots of short rides to develop muscle strength and balance. As your child gains more power and confidence, increase the wheel time and distance. — Diane Gervais, owner of Amato's Toy & Hobby in Middletown, Conn., told TDmonthly in a March 2014 survey that Hape ride-ons were best-selling ride-on toys. Tundra Wooly Mammoth is 12 in long, but appears bigger and fluffier in his long plush materials. His pure white tusks add to his allure. SRP $24. Contains over 40 parts. 165 experiments can be completed using the kit, like a spinning lighted fan, a small RC car that moves forward and backward, and more. 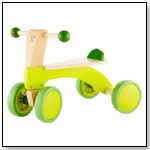 It stimulates the mind and teaches kids about electrical engineering, gears and rations in a fun and educational way. 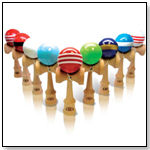 The Yomega Kendama Pro is a professional model based on our popular Kendama. This piece is crafted out of wood, making for a better grip and a premium feel. Catch the competition-sized ball on the various size cups, then go for the spike, landing the ball on the pointed tip. A game easy to learn yet difficult to master, ensuring hours of concentrated play. Disruptus taps into the innate ability of the creative mind to see things in surprisingly new and different ways, spurring players to new levels of innovation and creativity with bouts of silliness and hilarity erupting frequently along the way. Players look at images on the cards and follow whichever of the four innovation methods (Create 2, Improve, Transform, Disrupt) is face up on the die as they jot down their ideas with pencil and paper. The player with the craziest, most innovative idea for modifying the objects wins the round. There are several play variations for players of all ages and abilities. Grunting Pig by FOLKMANIS INC.
— In a June 2014 survey, four out of 10 retailers told TDmonthly that Folkmanis was their best-selling puppet brand. Perfectly portable and tons of fun – it’s Yoga Spinner! 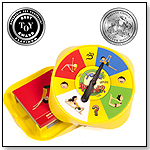 Players spin the spinner, collect cards and attempt to perform yoga poses -without falling down laughing. The first player to collect one card of each color first wins. Yoga Spinner enhances coordination & balance, increases physical strength and develops greater flexibility. Includes spinner, 54 yoga pose cards, 12 group cards, card storage and instructions. Get both mentally and physically fit while having fun with this creative game. Players roll the die, pick a card and perform a basic yoga pose or answer questions about nutrition and the environment. The first player to reach "OM" wins. The Magic Path of Yoga helps to strengthen & tone muscles, improve posture and inspire teamwork & cooperation. 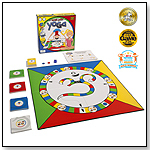 Includes 85-page booklet, game board, die, 2 game tokens, 54 yoga pose cards, 12 group pose cards, 64 quiz cards and instructions. Viewing products 51—60 out of 1181 products. Following are some of the programs represented in TDmonthly.com's section of award winners: Dr. Toy, iParenting Media Awards, TIA T.O.T.Y., Oppenheim Toy Portfolio, The National Parenting Center, and Parents' Choice Awards. You may also access TDmonthly's review section to see which products earned 5 TD stars. · Is Electronic Arts wedded to the video game dinosaur – the consoles?